Our back deck comes straight off our living room, which means it sits pretty high up off the ground. 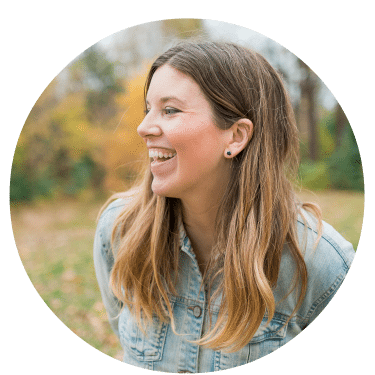 I like the ease of going in and out (especially since we put in a really wide patio door for that “inside-outside” vibe), but I didn’t love being able to see over into our neighbours backyard. The solution? 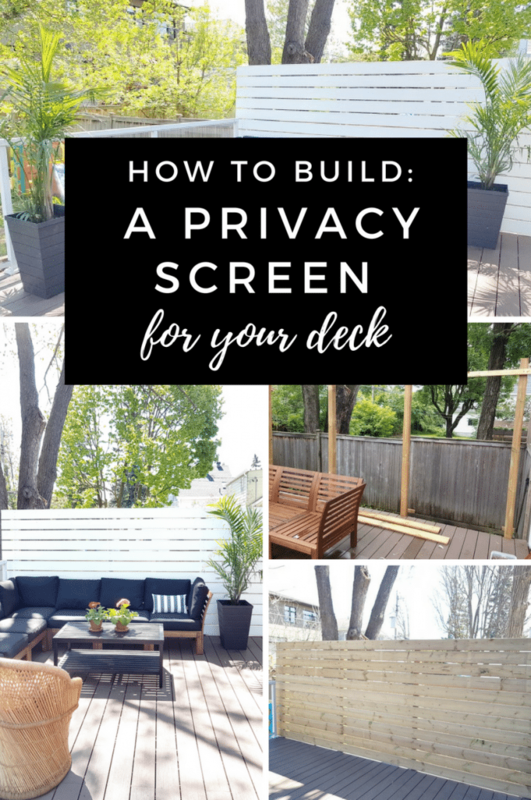 We had to build a privacy screen for our deck and it has made ALL the difference. 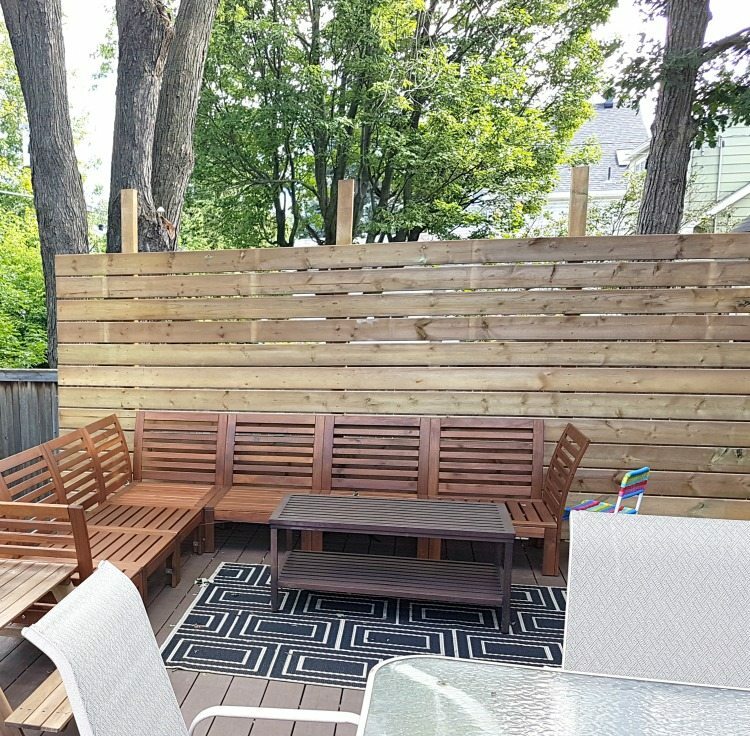 Not only does it provide the privacy we were after, but it has also made styling the deck so much easier! Keep reading for the step-by-step tutorial. 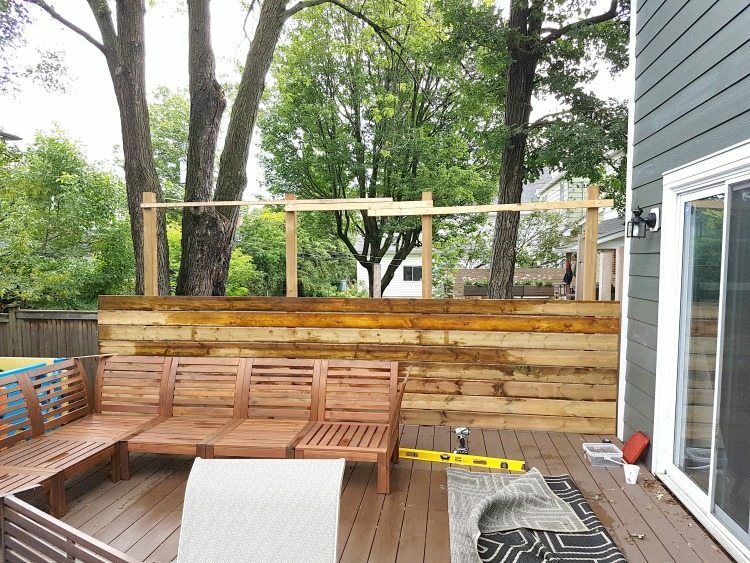 Based on the size of your deck, you’ll need to pull together the lumber for the screen. 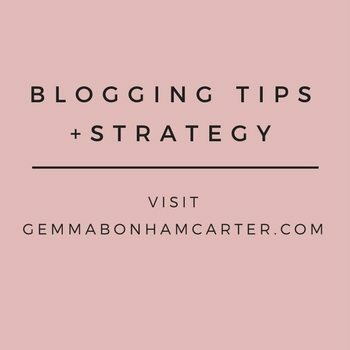 You need lumber for both the upright posts and the ones that will plank horizontally across. We used pressure treated 4×4 lumber for the 4 upright posts. 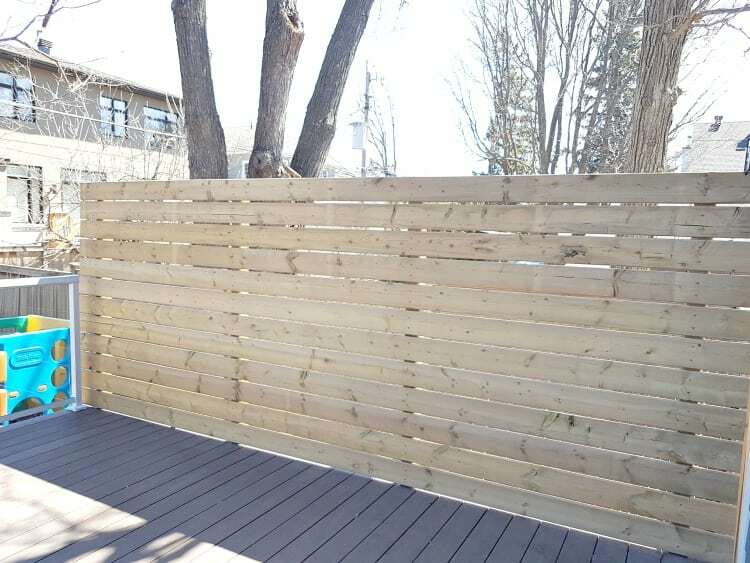 For the horizontal posts, we used 16 ft long pressure treated deck planks. 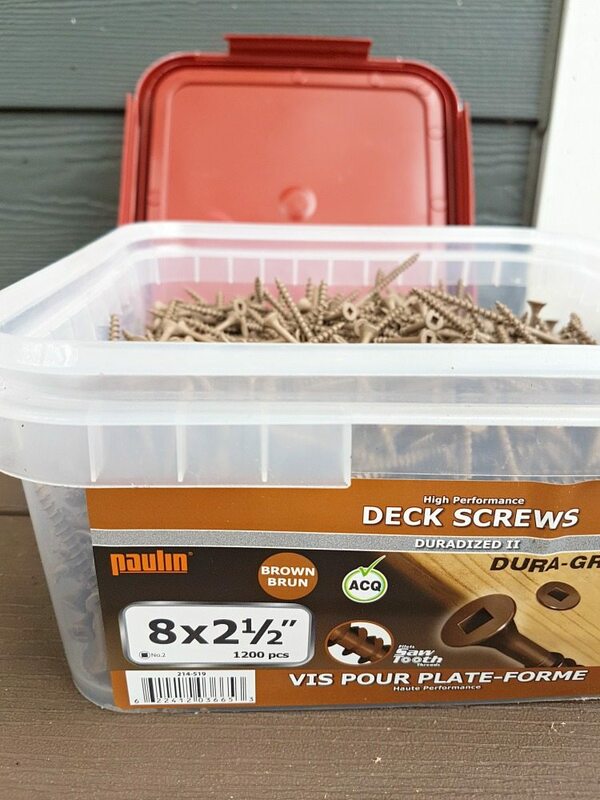 You’ll also want to get deck screws to assemble your screen, and have your drill on hand (we have this drill). 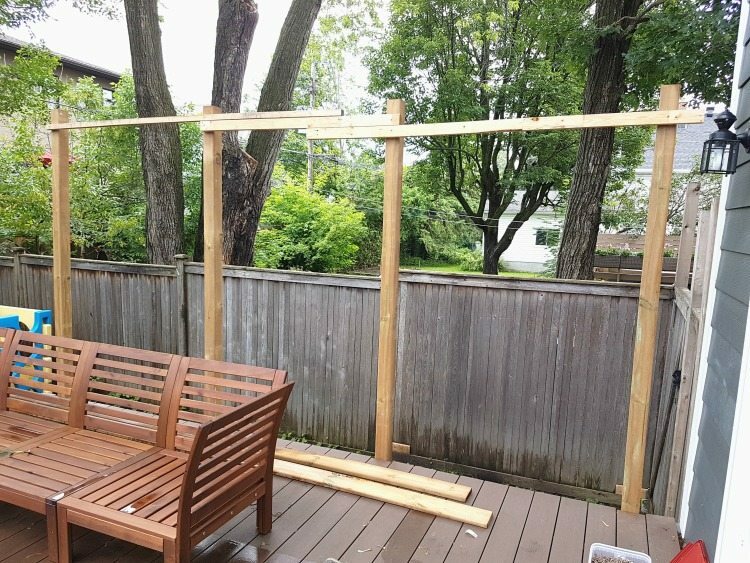 When you build a privacy screen, it’s important to look at the building codes for your specific region to make sure that the privacy screen meets the local regulations (both height and how they are attached & built). The 4×4 posts used to support the screen are bolted onto the deck frame and secured according to local regulations. They extend down into the ground to ensure stability of the posts. 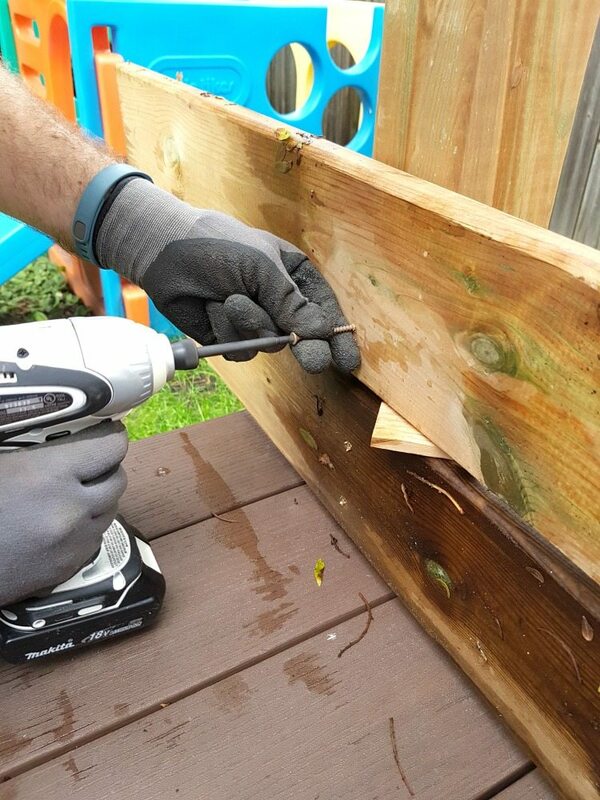 The deck planks were then secured to the 4×4 posts using 3-inch deck screws and an impact drill. We used a wood chip between the planks as we put them up, to ensure that they would all have the same spacing between them. Once all of the planks were up, we trimmed the outer edge using a chalk line and this circular saw. 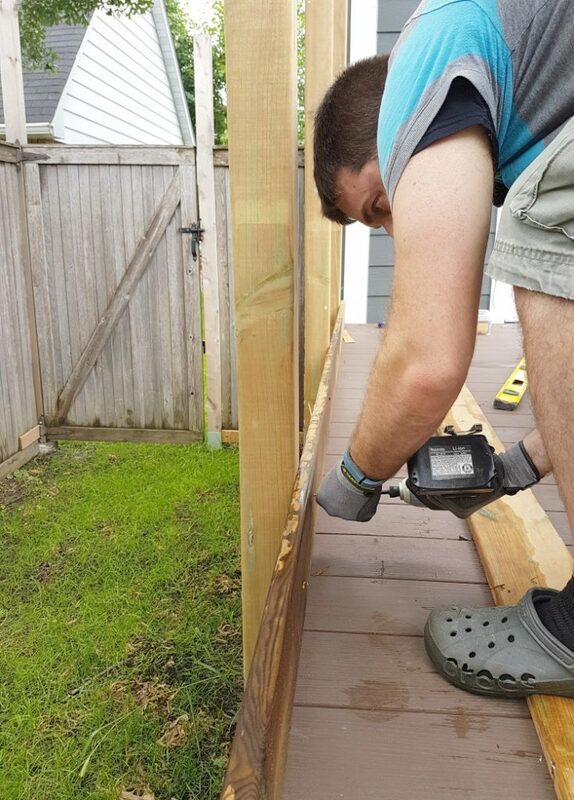 We also trimmed off the top of the posts, in line with the deck boards. 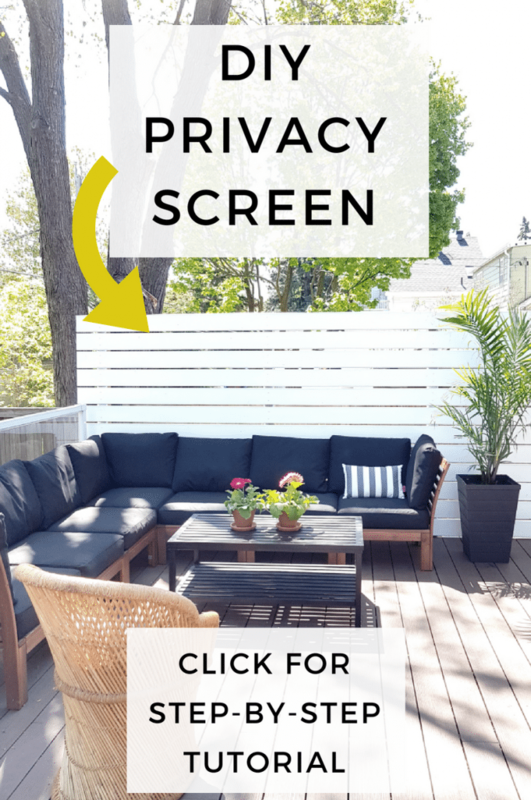 If you want a wood-look to your privacy screen, then you could just stop here. 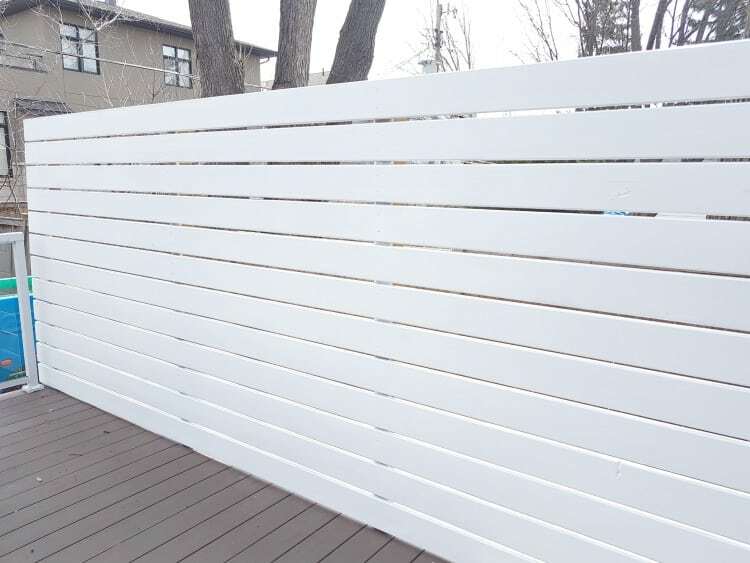 Because we already have a lot of brown going on in the deck and furniture itself, I knew I wanted to paint our privacy screen white. I used an outdoor water-based paint, in off-the-shelf white. 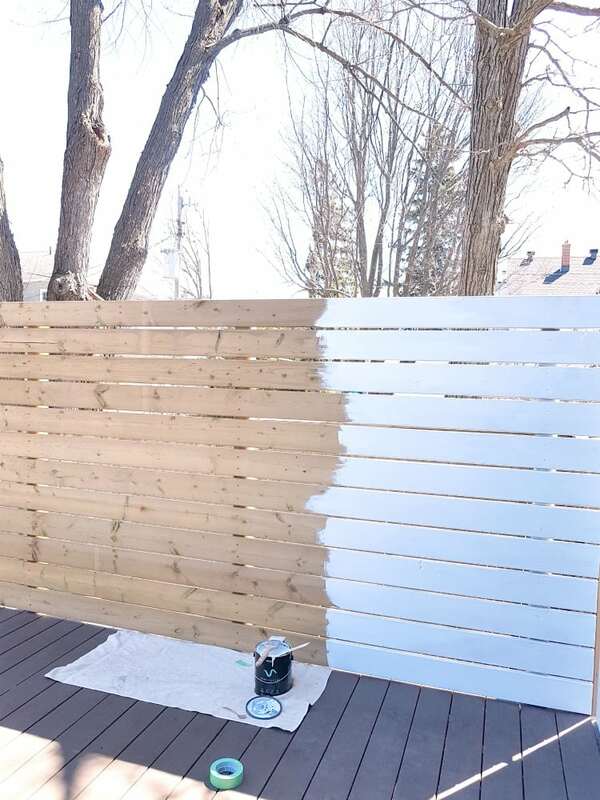 I personally used a brand from Canadian Tire, but the brand doesn’t matter so much – what matters is that it is a paint meant for outdoor application. I applied the paint with an angled brush instead of a roller, because it was easier that way to get into the nooks and crannies. Two coats of paint, and it was finished! Once the screen was up, I was finally able to accessorize the lounge area. I’m not done yet, but it’s started to look cute! 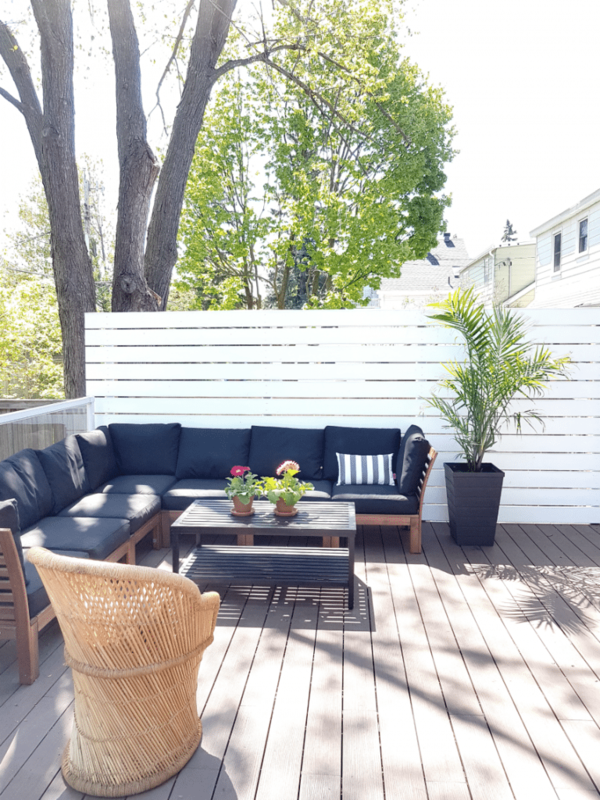 The outdoor sectional is from IKEA, the striped outdoor cushions are from Wayfair, and the plants are “majesty palm” trees planted in black planters from Costco. The coffee table and wicker chair were both garbage-picked. Can you believe it? We are majorly enjoying lounging out on the deck now. 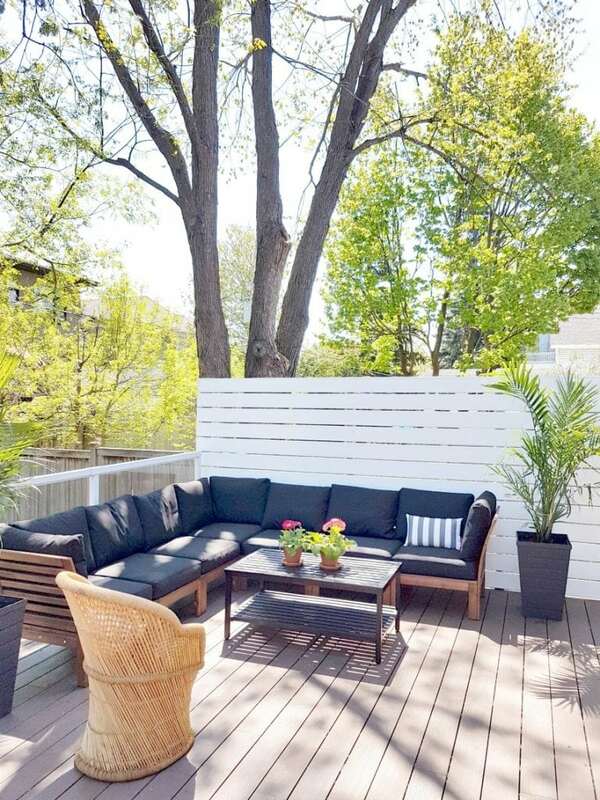 A cute and private space!